Tourists come to the Trinity Church cemetery and mausoleum in Washington Heights to learn about upper Manhattan’ s past. 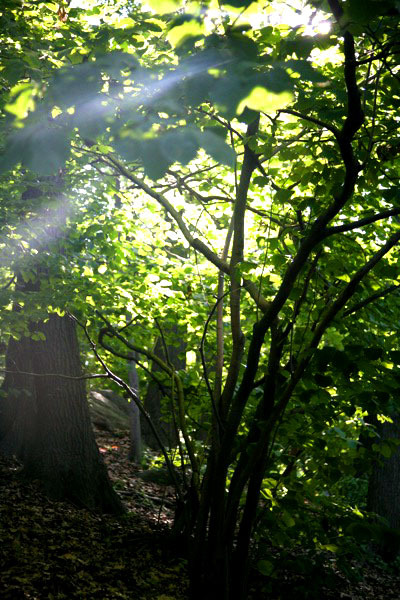 The 168-year-old burial ground provides the final resting place for many celebrated New Yorkers: John James Audubon, Clement Clarke Moore, Ralph Waldo Ellison, and Jerry Orbach, to name a few. Community Board 12 Historian James Renner serves as a knowledgeable guide, leading the way past hundreds of tombs that stretch over two city blocks. Renner led a group of sightseers through the maze of graves on Sunday and allowed The Uptowner to tag along. Another cemetery and mausoleum tour is scheduled for late December. Renner’s collection of upper Manhattan research can be found here. I am in the realest place in Manhattan. A spot at the absolute top of the island where landscaping and development stop and in a dissonant fusion, city and wild world meet. This place is home to a living Native American history and to Manhattan’s only primeval forest, a raw and honest northeastern wood that rises over the Hudson. Beyond the forest there is a wide meadow and a thriving salt marsh, untouched by developers so intent on rounding off the rest of the island’s shores. Wildlife scuttles through the meadow grasses and into the forest’s brush. There are muskrats, rabbits, brown bats, blood-red salamanders and white-footed mice. Herons and snowy egrets touch down in a tidal estuary, where mute swans, mallards and canvasback ducks paddle in wide circles and sleep under dim lamps alongside bordering chunks of grey gneiss and glinting schist rocks. 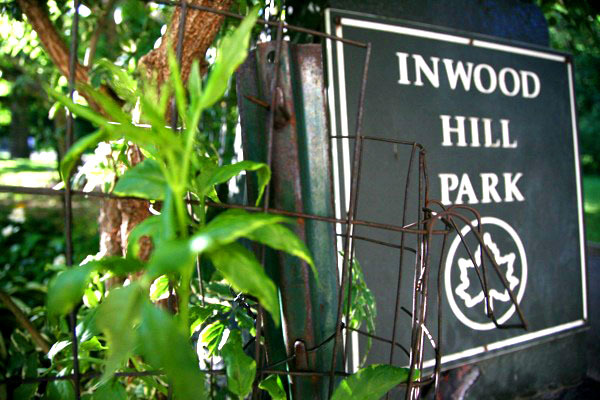 This is Inwood Hill Park, my favorite place in the city. 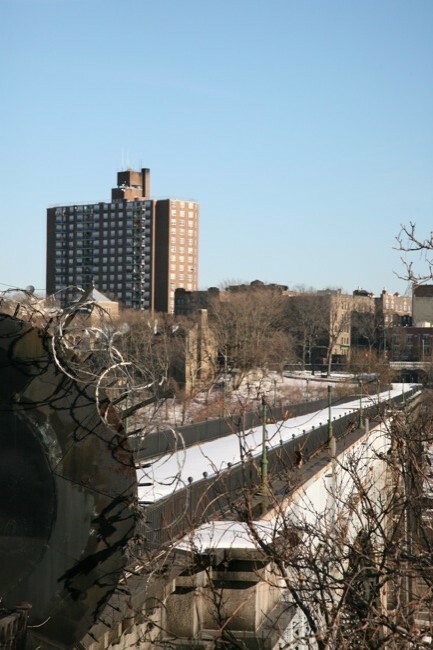 The parkland borders Inwood, one of the last of the island’s neighborhoods. I lived here at this city’s end as a small child, and it’s where my parents were born and raised. Leave Inwood and you’re crossing the Harlem River into Marble Hill or the Bronx. In fact, the park is so far north that most city maps slice it right off. It may only be steps away from Fort Tryon Park—with its popular medieval museum and frame-ready views of New Jersey’s Palisades—but most New Yorkers have never advanced those extra steps to see it. If you ever wanted to know the history of the actual High Bridge, which is NYC’s oldest standing bridge, then this Channel Thirteen video is just the ticket. The High Bridge just like the rest of Uptown is experiencing a renaissance and is slated to re-open in 2013. The High Bridge will be another reason to love Uptown. There is truly nothing as rewarding as being called upon to serve, in some unique way, the very place you have called home for decades. For me, this came one wintry morning in January 2007. At the time, I was a draftsman for a small architecture firm in Brooklyn, studying part time to get my architectural degree and just scraping by financially. That morning, the boss was eager to greet me at the door, rush me to his Jeep, and quickly explain what was happening. “Well Tony,” he said, flooring the pedal, “I’m letting you run point on this project. There’s a fire damaged building in Washington Heights, and they asked us to take over the process of getting permits for them to continue work.” He was referring to 1620 St. Nicholas Ave, where a fire had broken out just a few weeks previously, taking out a pharmacy, an eatery, and quite a number of apartments on the southwest corner of the building. Now, I was only on the job for about three weeks, but I knew enough about what he meant to know this was going to take up a lot of my time for the next few days. The process, while simple, involves a tremendous amount of waiting. First, plans of the original structure are drawn up, and then a second copy is drawn up showing the revisions, changes, and repairs. These are submitted to plan examiners at the building department who run through them with a fine-toothed comb and annotate any issues. The next step is to check online to see if the plans have been reviewed, and what, if any, issues have been brought to light and then you schedule an appointment with the examiner to either talk your way out of the building code or understand better what needs to be changed. In general the process takes about a month to two, depending on such factors as re-zoning, fickle examiners and ambiguous building codes. The first problem, and most major one, was that there were no plans on record for the building. There was only one for the main floor, drawn about fifteen years previously, and which had since been changed. To get the remaining six or seven floors drafted, I had to go and physically measure them out. Floor by floor, every nook and cranny and crevice, armed with little more than a clipboard, pencils, tape measure and a flashlight. For the next three days, working over eight hours at a stretch, I battled the freezing cold and measured out each apartment. I have never seen destruction so up close…parts of the floor had given way, broken glass lay every where, standing water in the toilet bowls was frozen solid. Fridges were propped open as their contents slowly diffused the aroma of decay. The windows were blackened by smoke, making natural light almost impossible to get. Charred toys laid next to burned out furniture, photo albums melted into hardened puddles, abandoned dumbwaiter shafts laid bare. And it was quiet. Intensely, oppressively, quiet. By Friday, the plans were submitted to the D.O.B and after a rather intense week of waiting and checking online to see just how many problems the examiner would fabricate, we found that they had been approved. Within hours, the permits were tacked up on the front door and the reparation process began in earnest. What was sure to be about a two-month wait, was knocked down to just a few weeks! That was almost four years ago yet the lesson I learned would stay with me for life. Of course, I have since transitioned out of architecture and went in a totally different direction, but nonetheless, I will continue to look for ways to service my community with the skills I have. Truthfully, when it comes to using them, there is no place quite like home. Yesterday, NBC New York online posted an amazing video that delved into the remarkable hidden history of Washington Heights. New York Nonstop’s Lynda Baquero and Rolando Pujol of AMNewYork dig into the rich historical background of this neighborhood from the colonial era Morris Jumel Mansion to a secret staircase which still exists that once led to the legendary Polo Grounds. Did you know that such giants as W.E.B. 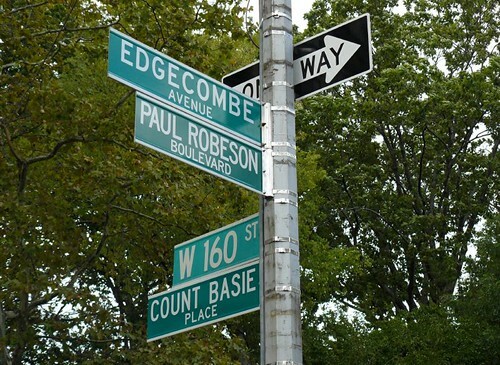 DuBois, Duke Ellington, Count Basie, Thurgood Marshall and Paul Robeson among others once called the Heights home? A town bordered by rivers. The city was on a hill. Actually spanned two hills, nestled, warm. This city was small, separate, cozy. The place was filled with laughter and song. Some who fought the law. Some who fought the inevitable. Some who fought the stereotype. This city was old, historic, evolving. Not the ones spanning the rivers.